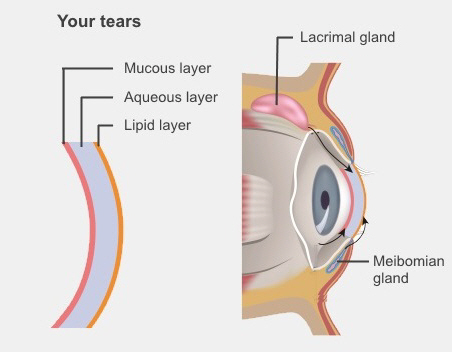 Our tears have three layers: an oil layer on top, a water layer in the middle and a mucus layer at the bottom. The oil is produced by the meibomian glands, which are on the edges of our eyelids. It stops our tears from evaporating too quickly. The water is made in our lacrimal glands, which are just above the outside edge of our eyes. The goblet cells, which are on the whites of our eyes, make the mucus, which helps the tears stick to our eyes. When you blink, your eyelids spread the tears over your eyes to keep them moist. The tears then drain through your tear ducts into your nose. your tears aren't draining properly. thyroid eye disease (but this is not common). lax eyelids (also called ectropion). If your lower eyelid turns outwards, tears might roll off the bottom of your eyelid, rather than into your tear ducts. Some babies are born with a tear duct that hasn't fully opened. This usually opens fully by one year, without any treatment. If this applies to your baby, clear any discharge from their lids with warm water. Babies usually don't need to use antibiotic drops. What are the symptoms of watery eyes? On the next page: How are watery eyes diagnosed and treated?